The Sri Lanka Flag features a yellow field that has two panels. The smallest panel, on the left-hand side of the flag consists of two vertical bands in the colors of green and saffron. The larger panel, on the right-hand side of the flag consists of a maroon field with a golden lion that is holding a Kastane sword in its right fore paw. In each corner of the maroon field is a bo leaf. 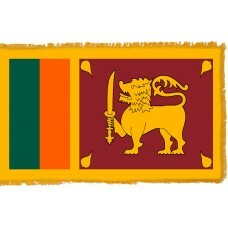 Every part of the Sri Lanka flag represents and means something. The lion represents the "Sinhala People" (the Sinhalese), the Bo leaves represent the four concepts of Buddhism, which are, "Metta," "Karuna," "Mudita," and "Upeshka" (which translate as loving-kindness, compassion, sympathetic jo,y and equanimity). The Kastane sword that the lion is holding represents the "Sovereignty of the Nation," and the curly hair on the lion's head represents the religious observance and wisdom. The eight hairs on the tail of the lion are symbolic of the Noble Eightfold path and the beard of the lion is symbolic of the purity of words. The nose of the lion represents intelligence, the two front paws symbolize the purity in handling wealth, and the handle of the sword represents the four elements of water, fire, air, and earth. Sri Lanka is an island country in the Indian Ocean that was known as "Ceylon" before its name was changed to Sri Lanka in 1972. It is one of the few countries that has two capitals. Its legislative capital is called "Sri Jayawardenepura Kotte" and the commercial and judicial capital is called Colombo, which is also the largest city in Sri Lanka. Sri Lanka, which also translates as "Sacred Island" is often referred to as "Pearl of the Indian Ocean" or "teardrop of India" due to the shape of the country. Sri Lanka is a country that has been under the control of various governments for many years. In 1505, when Portuguese officer, Laurenco de Almeida arrived on the island, the first European settlement was built. In 1658, Sri Lanka then became part of the Dutch Colony and in 1796, it came under British rule and was part of the British colony until its independence in 1948. Sri Lanka is now the second richest nation in South Asia and a lot of its income is from the production of tea. Sri Lanka is the fourth biggest producer of tea in the world as well as the world’s leading exporter of it. The economy is also reliant on agriculture, rice production, and textiles. Tourism also contributes to the economy and Sri Lanka has become a popular country to visit due to its beautiful and historic sites, such as the "Sigiriya Rock Fortress" which is a gigantic column of rock that rises 200m from below and is Sri Lanka's most popular tourist attraction as well as being listed on the UNESCO world heritage site.